Who hath not own'd, with rapture-smitten frame, The power of grace, the magic of a name. If you are a parent, you can definitely remember the numerous conversations you and your spouse had about names for you baby. There were always some on each of your lists that you loved, but the other hated - ones that were lovely, but the nickname would be hideous. Some parents go with traditional names like Emma, William or Caroline. While others want hip and trendy like Neaveh or Shiloh and other still want, well... just the plain old weird that will have their kids cowering until they're old enough to have their names legally changed - names like Moxie Crimefighter (Penn Jillette's child), I. P. Freely - yes, you read it right (David Carradine's child) or Kal-el - after Superman, himself (Nicholas Cage's child). The name that you give your child, naturally will be with them for life (no pressure here to pick the right one). Just think of how some of those stranger names will work out if those children become judges, doctors, or just about anything with a nametag... geeez, poor kids. Now there is a book, The Complete Idiot's Guide to 40,000 Baby Names, 2nd Edition that can help you make the very first super important decision in your baby's life. This book boasts over 150 lists of names from every category imaginable - from "Soap Opera Hunks and Hussies" and "American Idol Finalists" (how many of us are going to name our child Sanjaya?) to "Nobel Prize Winners" and "Hockey Hunks". There are names from silver screen legends, sports giants, and music stars, along with names inspired by nature, scientists, artists, even famous and successful CEOs. The book even gives you a heads-up on probable nicknames for the name you choose. Combine that with the second half of the book which is your standard baby name book and you'll definitely be prepared for making one of those all-important decisions in your baby's life. 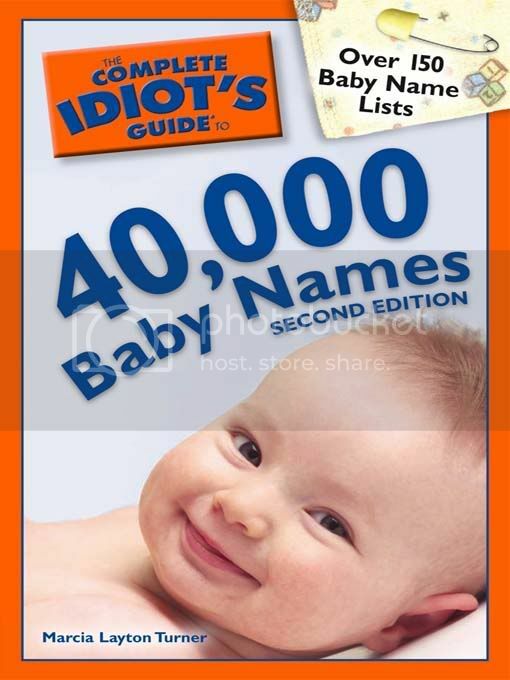 We have One (1) copy of The Complete Idiot's Guide to 40,000 Baby Names, 2nd Edition to give away to one lucky reader. This contest ends TODAY Friday, June 5th at 11:59pm (pdst) so don't wait - make sure you've gotten all seven entries TODAY! Please note: entries received after the cutoff time will be deleted prior to drawing a winner. This would be me commenting, on a post, per the rules!